I will always strive to achieve the goal of leisurely mornings before work. I would love nothing more than to wake up early enough to get a full workout in and read the newspaper. I truly believe that someday it will happen! But until then I will just have to do the best with what I can. Maybe I should start with not hitting snooze! :-P It has also been helpful to use a breakfast smoothie to help me speed up my morning routine. I found dozens of great recipes online, but what works best for me is a simple formula to mix things up. My breakfast smoothie is a complete meal. It’s the ultimate “fast food” because it can be whipped up in an instant. I love a green veggie boost in my smoothie to add fiber and nutrients without a lot of additional calories. Frozen fruits are the easiest, as they are usually pre-cut and you can have a variety of them in your freezer ready to use. I always make sure to have a source of protein in my smoothies to keep me full throughout the morning. Protein powders are available everywhere these days in a variety of flavors. I use the Whole Foods 365 Everyday brand vanilla whey protein or Vega One French Vanilla. It’s fun to experiment with the extra spices and add-ins to the smoothie to really create a unique flavor. A dash of cinnamon or ginger goes a long way, and flax meal or chia seeds add healthy fats, fiber and make for a thicker textured smoothie. When making a smoothie it’s important to remember that it is very easy for calories to add up when adding in multiple servings of fruit, nuts, seeds and sweeteners, and also from the liquid you choose to start with. If you are interested in controlling your weight consider omitting sweeteners, limit the amount of extras you use and stick with one ½ cup serving of fruit to blend in. A good protein powder will become handy if trying to control hunger and calories, as they usually are found in a variety of flavors, not just vanilla and chocolate, that can make a tasty shake without all the added ingredients. And remember fruit juice has a lot of natural sugars, so diluting juice with water will cut the calories while preserving the flavor of the juice. But feel free to use all the spices, herbs and greens your heart desires to make a deliciously filling and lower calorie breakfast smoothie! This month I will be mixing up different smoothies every week, so check back for the latest recipe every Sunday! There has been very little time during the past few weeks to focus on eating well. Here in Massachusetts we’ve experienced the worst winter since I’ve lived here – over 100 inches of snow in less than one month! The winds have been terrible, there’s no place to put any new snow and my commutes have been 2+ hours each way to work. Geez! It’s been difficult to find any time to cook well or to exercise after hours of driving and shoveling. I wish I had as much excitement about the snow as Jim Cantore! We’ve been experimenting with various recipes for the Instant Pot. Most of them have been hearty and heavy, so I attempted to find a way to lighten up our wintry meals by using healthier ingredients. 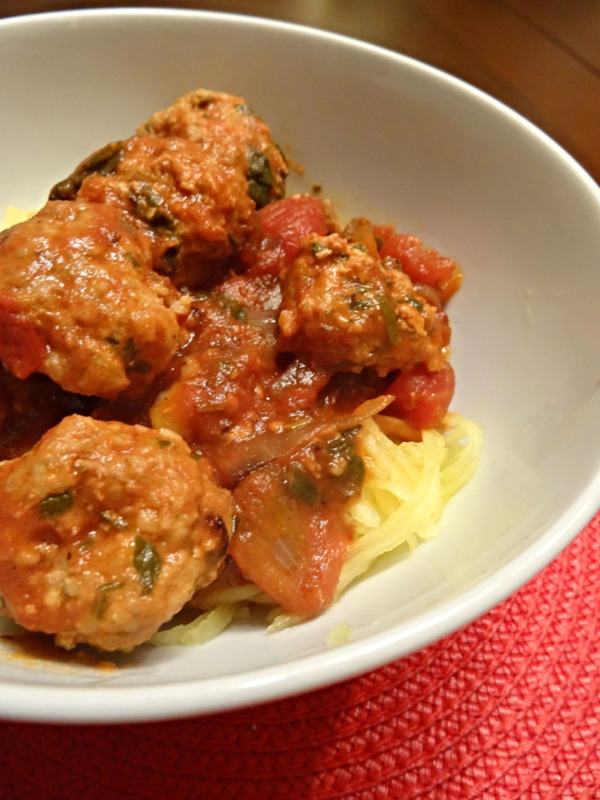 I opted for lean ground turkey meatballs, which are leaner than beef and easily takes on the flavors of spices added to it. The homemade tomato sauce was made right in the cooker using canned diced tomatoes and herbs, reducing the need for processed and added sugar pasta sauces from off the shelf. Spinach was added to the sauce for a boost of veggies and I used spaghetti squash as my base, which makes this dish low-carb and light. If you’ve never made spaghetti squash before, The Kitchn has a great tutorial to show you how easy it is to prepare. It bakes in the oven while you are prepping the sauce and meatballs, so it can be timed perfectly. If you aren’t yet a fan of spaghetti squash you can also use whole wheat pasta with this recipe. This is my first pressure cooker recipe, so if you have any comments or can suggest any changes I would love to hear from you! 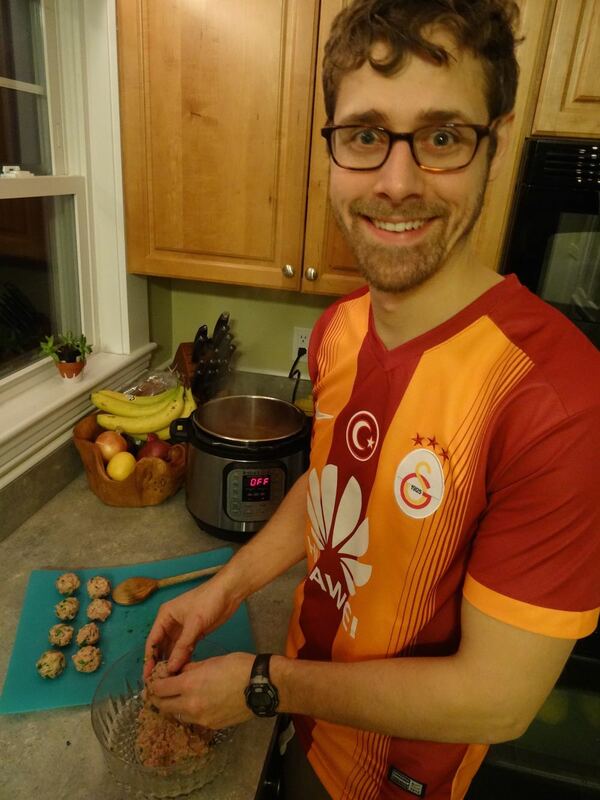 My recipe is inspired and adapted from a recipe I found after googling “turkey meatballs pressure cooker”. Let me know what you think in the comments! Preheat oven to 400°. Cut spaghetti squash in half lengthwise and drizzle olive oil on top of squash. Place face down on sheet pan and bake for 30-40 min. Set electric pressure cooker to sauté/brown. Add olive oil to the pot and sauté diced onions. When the onions are translucent add garlic and cook for 1 minute or until fragrant. Add red wine and cook until most of the alcohol has evaporated (approx. 2 minutes). Add the rest of the ingredients and stir. Continue to simmer with cover off while preparing meatballs. Place all ingredients for meatballs in bowl and mix until well combined. Roll mixture into 1 inch balls and place in the pressure cooker pot with tomato sauce. Cover pressure cooker. Turn electric pressure cooker off of sauté and set to high pressure for 5 minutes. When the cooking is complete, carefully release pressure. Using a fork shred the spaghetti squash into a large bowl. To serve place shredded spaghetti squash into individual bowls and top with sauce and meatballs. Add shredded parmesan if desired and enjoy. A lazy Saturday morning helped me come up with my new favorite oatmeal flavor combination. I was simply trying to figure out a way to use up the rest of my candied ginger when it dawned on me. The day before I had purchased two quarts of blueberries,and then all of a sudden this tasty and super healthy idea came together! Blueberries are rich in antioxidants, such as anthocyanins (which impart the blue, red and purple pigment in berries). Antioxidants may reduce the risk for certain cancers, heart disease and other chronic diseases through their ability to prevent or slow the damage to cells during the aging process (read more about antioxidants at the National Cancer Institute website). Ginger is a root spice found in many cultures that has also been used for centuries as a medicine to relieve nausea or stomach aches. The almonds provide some added protein, fiber and heart-healthy fats. Last but not least, the oats are whole grain, which help lower cholesterol, are packed with minerals, antioxidants and can also aid in weight loss by keeping you satisfied well into your morning. (Check out the Whole Grains Council for more information about whole grains, why they are so good for you and even cooking tips for all the different kinds of grains). This recipe is slightly sweet, yet also a little savory, as the ginger still has some spice even though it’s been candied. It’s the perfect pairing for a cup of French-Press on the porch, or even when re-heated as a quick on-the-go breakfast at work. Enjoy! The finished product with a little milk poured over it. Delicious! Boil the water in a pot. Add the steel cut oats once the water is boiling and stir. Cook uncovered until the water is boiling again, then lower the heat to a simmer and cook for 30 min. Remove cooked oats from the heat and mix in brown sugar and cinnamon. Add the ginger, blueberries and almonds and mix in until distributed evenly in the oatmeal. Serve with a splash of milk on top, or add few extra blueberries or almond slices. If making for breakfasts at the beginning of the week, store in containers without milk on top, and then reheat as needed. Save leftover oats in jars to reheat throughout the week for a quick and easy breakfast.